Please visit our Open House at 401 2165 40TH AVE W in Vancouver. THE VERONICA! This Southwest facing one bedroom co-op apartment with large balcony looks out to the green trees and over the Kerrisdale streetscape. The concrete building has undergone a complete upgrade including parking membrane, windows, exterior, balconies, roof, plumbing, boiler and elevator. A bright, open and efficient layout that retires in the evening with a warm sunset. Tidy kitchen with dishwasher. Hardwood floors throughout. Walk out of the lobby to a world of convenience; shopping, recreation and restaurants. Have a coffee with friends. Stroll, shop, eat, repeat. Unbeatable value for Westside living. YOU'LL LOVE IT! I have listed a new property at 401 2165 40TH AVE W in Vancouver. 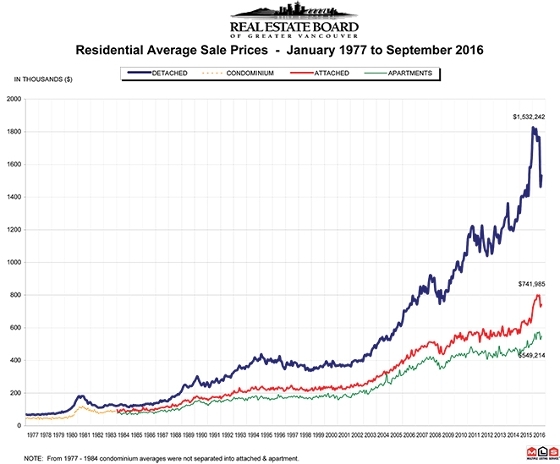 VANCOUVER, BC – October 4, 2016 – Metro Vancouver* home sales dipped below the 10- year monthly sales average last month. Metro Vancouver home sales totalled 2,253 in September 2016, a decrease of 32.6 percent from the 3,345 sales recorded in September 2015 and a decrease of 9.5 percent compared to August 2016 when 2,489 homes sold. Last month’s sales were 9.6 percent below the 10-year sales average for the month. New listings for detached, attached and apartment properties in Metro Vancouver totalled 4,799 in September 2016. This represents a decrease of one percent compared to the 4,846 units listed in September 2015 and an 11.8 percent increase compared to August 2016 when 4,293 properties were listed. The total number of homes currently listed for sale on the MLS® system in Metro Vancouver is 9,354, a 13.4 percent decline compared to September 2015 (10,805) and a 10 percent increase compared to August 2016 (8,506). The sales-to-active listings ratio for September 2016 is 24.1 percent. This is the lowest this ratio has been since February 2015. Generally, analysts say that downward pressure on home prices occurs when the ratio dips below the 12 percent mark, while home prices often experience upward pressure when it reaches the 20 to 22 percent range in a particular community for a sustained period. The MLS® Home Price Index composite benchmark price for all residential properties in Metro Vancouver is currently $931,900. This represents a 28.9 percent increase compared to September 2015 and a 0.1 percent decline compared to August 2016. Sales of detached properties in September 2016 reached 666, a decrease of 47.6 percent from the 1,272 detached sales recorded in September 2015. The benchmark price for detached properties is $1,579,400. This represents a 33.7 percent increase compared to September 2015 and a 0.1 percent increase compared to August 2016. Sales of apartment properties reached 1,218 in September 2016, a decrease of 20.3 percent compared to the 1,529 sales in September 2015.The benchmark price of an apartment property is $511,800. This represents a 23.5 percent increase compared to September 2015 and a 0.5 percent decline compared to August 2016. Attached property sales in September 2016 totalled 369, a decrease of 32.2 percent compared to the 544 sales in September 2015. The benchmark price of an attached unit is $677,000. This represents a 29.1 percent increase compared to September 2015 and a 0.1 percent decline compared to August 2016. I have sold a property at 2037 ALLISON RD in Vancouver. Set amid the storied backdrop of the UBC campus in Point Grey. This wonderful family home is located in one of Vancouver’s premier areas. Built in 1951 with oak hardwood floors and gorgeous inlay, it’s bright and spacious. Large principal rooms with formal living and dining. A full basement with recreation and family room. The over sized master bedroom could be converted back to give three bedrooms on the main. The kitchen has its own eating area and looks out to the generous backyard with swimming pool, mature gardens and apple tree. Two car garage and fully fenced private backyard. This is a secure investment for the future, a location for generations, and the ideal place to make your dream home. YOU'LL LOVE IT!